I got a little bit of a thrill this morning when I was in the NCI Norma Smurfit Library to see my book on the library bookshelf! It's Call Number is 658.403. I took a quick picture with my iPhone while nobody was looking - it is very quite in the College this week. These books are located beside MIS books (Call No. 658.4038 - this is how I came across my own as I borrowed a popular MIS book written by Ken Laudon for class). 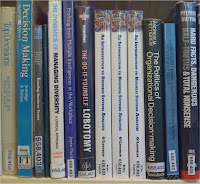 Books with a Call Number of 658.403 are associated with Business Management - especially in the area of Decision Making. My book is squeezed between The Politics of Organizational Decision-Making (Pettigrew, 1973) and The Do-It-Yourself Lobotomy (Monahan, 2002). I'm glad to see that the DIY Lobotomy book is about Creative Thinking and is not a Medical text. I hope the book makes it onto the shelves of other libraries. I'll make sure it stays on the NCI library shelf as long as possible as it will be on some of my module Reading Lists for some time. This poses an ethical dilemma - should Lecturers be allowed to recommend their own textbooks to their students? Especially when they have already paid fees? In my case the book was written specifically for a Business Systems Analysis module and contains all the notes and exercises I use in class. While all students in the class bought the book, I donated the proceeds (and will continue to do so for future sales) to the NCI Foundation. I am under no illusion that either the NCI Foundation will make much money out of this, or that I am giving up thousands of euro in royalties. Nevertheless, it eases my conscience a little bit to know that I am not trousering students' cash and exploiting their vulnerability.